Mon, Jan 21, 2019, 12:42 pm SL Time, ColomboPage News Desk, Sri Lanka. 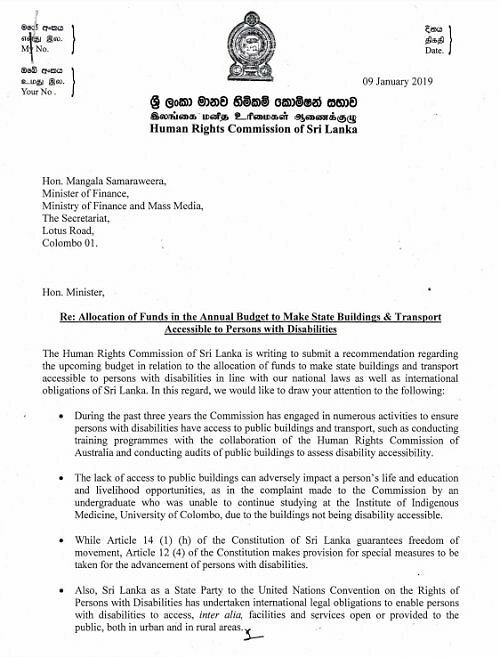 Jan 21, Colombo: The Human Rights Commission of Sri Lanka (HRCSL) has submitted a recommendation to Minister of Finance Mangala Samaraweera to allocate funds from the 2019 Budget to make state buildings and transportation accessible to persons with disabilities in line with national laws as well as interactional obligations of Sri Lanka. The HRCSL noted that during the past three years the Commission has engaged in numerous activities to ensure persons with disabilities have access to public buildings and transport, such as conducting training programs with the collaboration of the Human Rights Commission of Australia and conducting audits of public buildings to assess disability accessibility. The Commission referring to a complaint made to the Commission by an undergraduate who was unable to continue studying at the Institute of Indigenous Medicine, University of Colombo, due to the buildings not being disability accessible, pointed out that the lack of access to public buildings can adversely impact a person's life and education and livelihood opportunities. 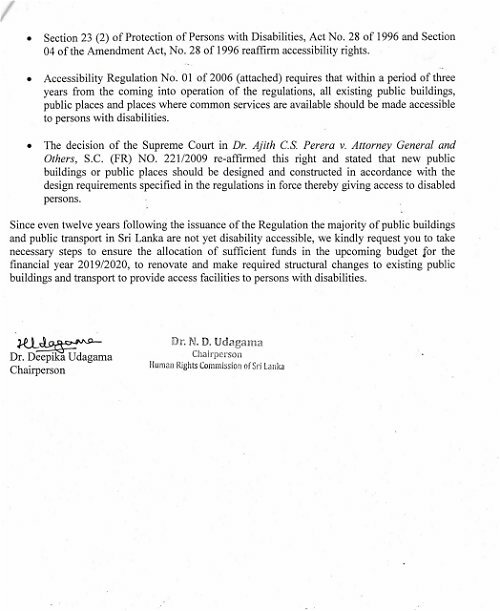 "Since even twelve years following the issuance of the Regulation the majority of public buildings and public transport in Sri Lanka are not yet disability accessible, we kindly request you to take necessary steps to ensure the allocation of sufficient funds in the upcoming budget for the financial year 2019/2020, to renovate and make required structural changes to existing public buildings and transport to provide access facilities to persons with disabilities," the Chairperson of HRCSL Dr. Deepika Udagama wrote.